“Many tasks and challenges lay ahead of us. So many people around the world are longing for help. We must be thankful that our possibilities to alleviate their suffering have increased over the recent years. In many parts of the world our eight-pointed white cross has become a sign of hope. Our efforts to expand our assistance must not cease. I am deeply grateful to all members and volunteers, who are so devotedly engaged to help our ’Lords the Sick’”. The Order of St John of Jerusalem is one of the oldest institutions of Western and Christian civilisation. Present in Palestine in around 1050, it is a lay religious Order, traditionally of military, chivalrous, noble nature. Its 13,500 members include Professed Friars and others who have made vows of obedience. The other Knights and Dames are lay members, devoted to the exercise of Christian virtue and charity. What distinguishes the Knights of Malta is their commitment to reaching their spiritual perfection within the Church and to expending their energies serving the poor and the sick. 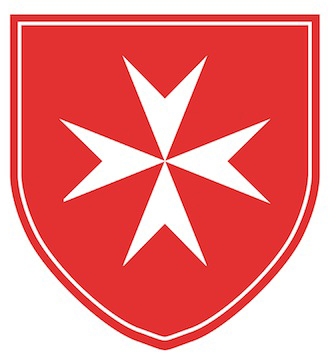 The Order of Malta remains true to its inspiring principles, summarised in the motto “Tuitio Fidei et Obsequium Pauperum”, defence of the Faith and assistance to the poor and the suffering, which become reality through the voluntary work carried out by Dames and Knights in humanitarian assistance and medical and social activities. Today the Order carries out these activities in over 120 countries. The Sovereign Order of Malta is a sovereign subject of international law, with its own constitution, passports, stamps, and public institutions. The 80th Grand Master, Fra’ Giacomo Dalla Torre di Tempio di Sanguinetto, was elected Head of the Order for life on May 2nd 2018. The Order has diplomatic relations with 108 countries – many of which non-Catholic – and missions to major European countries, as well as to European and international organisations. The Order of Malta is neutral, impartial and non-political, which is why it can successfully act as a mediator between States. The Order has recently returned to Malta, after signing an agreement with the Maltese Government which granted the Order the exclusive use of Fort St. Angelo for a term of 99 years. Located in the town of Birgu, the Fort belonged to the Knights from 1530 until the island was occupied by Napoleon in 1798. Today, after restoration, the Fort hosts historical and cultural activities related to the Order of Malta. The Order of Malta operates through 12 Priories, 48 national Associations, 133 diplomatic missions, 1 worldwide relief agency and 33 volunteer corps, as well as numerous hospitals, medical centres, day-care centres and specialist foundations. The Order of Malta has no economic nor political goal and is not dependent on any state or government.